a new resource focused on art and ecology for artists, curators, critics, commissioners as well as scientists and policy makers. it is ecoartscotland papers [ISSN 2043-8052] which will comprise of a mix of discussions of works by artists and critical theoretical texts. Published occasionally, we aim to have 6-8 significant essays per year/issue. Articles should be submitted to ecoartscotland (see terms and conditions). ecoartscotland is a curatorial platform. It has been established by Chris Fremantle, producer and research associate with On The Edge Research, Gray’s School of Art, The Robert Gordon University. Fremantle is a member of a number of international networks of artists, curators and others focused on art and ecology. He has worked with some of the eminent practitioners in the field including Helen Mayer Harrison, Newton Harrison and David Haley on Greenhouse Britain: Losing Ground, Gaining Wisdom (2006-2008) and with PLATFORM on Remember Saro-Wiwa. He has published on the subject and is co-author of the AHRC funded research report The Artist as Leader (2009). chris at fremantle dot org or http://chris.fremantle.org. Lots of things have an ‘eco’ prefix: corporate culture has recognised the value of green and politicians have climbed on the bandwagon. But underlying these issues are the deep dependencies of western culture on the extraction of resources mostly from places that are ‘off the radar’ (whether that is Douglas in South Lanarkshire or the Niger Delta) and economies dependent on growth. Although the largely unquestioned extraction of resources continues, there are some indications of a turning point. Nicholas Bourriaud, the curator, dated the end of modernism (the ultimate project of progress built on the assumption of limitless energy) to the oil crisis of 1973 (2008). We might equally point to the Archimedean moment following the Apollo Mission when we were first able to see ourselves from space. 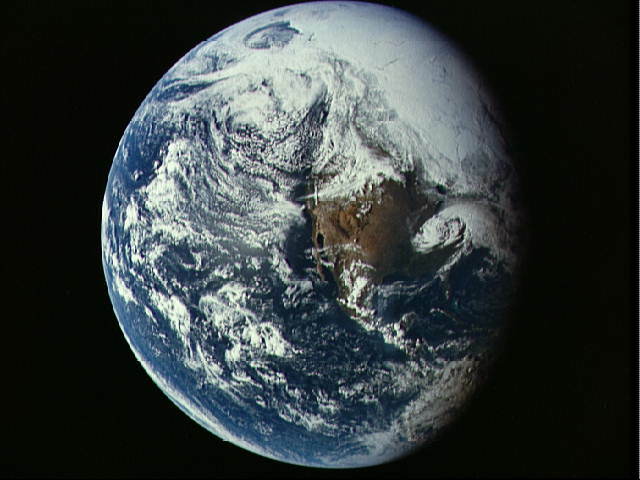 One of the recurring concerns in the making of art has been the representation of the human relationship with the world (and that image of the Earth in space, though not made by an artist, is one of the really important ones). What is the relationship of human beings to the world and does art have a role in questioning this relationship? Ecology (according to Wikipedia) is the interdisciplinary scientific study of the interactions between organisms and their environments. This can position the social, political and technological alongside the biological, chemical and physical. Some artists are equally interested in the interdisciplinary and the relationship between people and their environments. Artists are not simply illustrators or communicators for the sciences. Nor are they the decorators of social spaces or the people who bring creativity to the classroom. The most interesting are agents for change. There are both scientists and artists concerned with everything from micro-organisms in soil to the dynamics of bioregions. Scientists are interested in generating testable theories: they speak in terms of probability. Artists are more specifically focused on meaning. When these two concerns collaborate there are very interesting results. Some artists working with nature are widely recognised such as Andy Goldsworthy, as are some of the landscape/architects such as Charles Jencks. However the diversity of practices is far greater. Artists interested in ecology are are often seeking to reconnect these apparently different territories (social, political, technological with the environmental) and engage communities in ways to improve environments. Some work in this field specifically invites action on the part of people experiencing the work: to take some aspect of the art into their everyday lives, as a new understanding, or as a different way of living. In a piece I recently published, I highlighted a range of positions apparently taken by artists between making art which is overtly useful and making art which is ironic or primarily critical of the way things are done in the world. 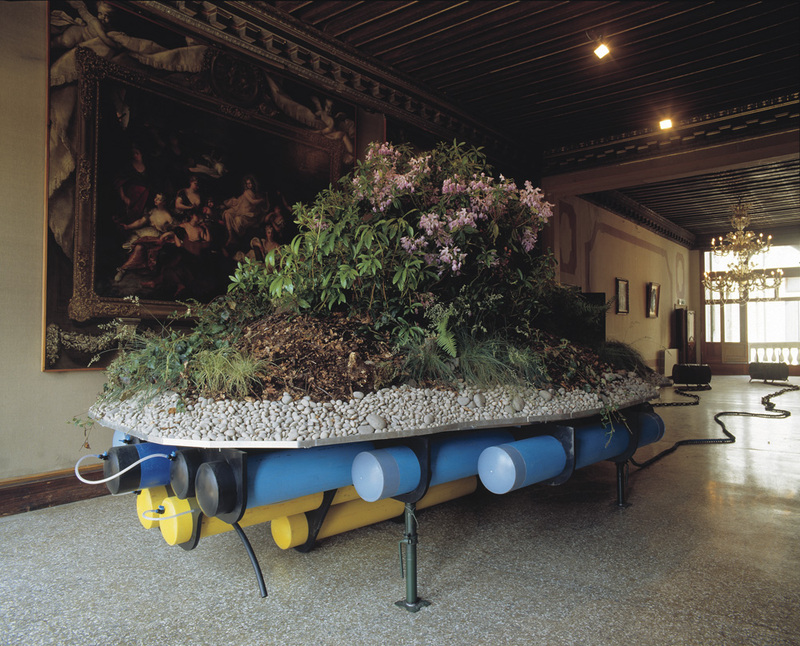 An example of work that is critical without being utilitarian is Simon Starling’s Island with Weeds – Prototype (2003) intended to float on Loch Lomond as a safe place for Rhododendrons. This work raises challenging questions about the idea of naturalness. Contrasted with this would be Helen Mayer Harrison and Newton Harrison’s Survival Piece #6: Full Farm (1974). 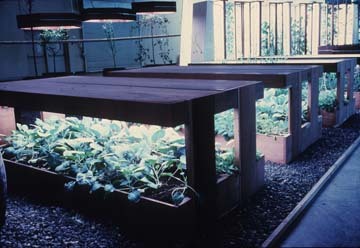 This work, comprising a number of earth filled boxes planted with a variety of vegetables and a fluorescent lighting system, was intended as an educational tool, teaching museum staff, visitors and school children the potential for urban farming. The Harrisons described their intention that all their works contribute to eco-systemic wellbeing, and have gone on to make work addressing bioregions which have influenced public policy. 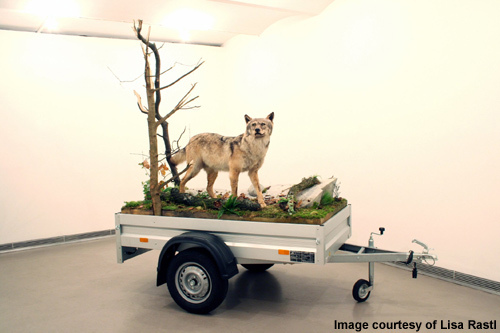 Mark Dion’s Wilderness Unit (2006) comments on the commercialisation of nature by placing a diorama of a wolf on a trailer: nature represented for convenient and mobile consumption. One of the complex issues for artists working in this field is that of the gallery (or other art space). Smithson’s idea of site and non-site, between the space of the abstract representation and the lived reality, is helpful to understand the art that we might see in different locations, whether that is at a landfill site or in a gallery (see Flam, 1996). Smithson is usually associated with the Land Art movement (and this does not always sit comfortably with artists interested in ecology), but his works and writings reveal an interest in the relationship between human beings and their environments that is very provocative. Work in the field of art and ecology has an ethical dimension, raising fundamental questions about value. PLATFORM‘s work Funding for a Change directly addressed the ethical dilemmas of corporate sponsorship. For some artists working in this field the spiritual is also an important dimension which needs to be reintroduced into everyday life. There is danger that this becomes another form of objectification, where the natural is pure or spiritual and separate from the human. Alistair McIntosh’s book Soil and Soul: People Versus Corporate Power (2001) makes a compelling case for the spiritual dimension without being ‘new age’. The genre of art and ecology has produced some outstanding works of art by any standards. It has also produced some works of art which have had a significant influence on our understanding of our relationship with our environment (the world). For further reading on what ecoart might be see Beth Carruthers’ Mapping the Terrain of Contemporary Eco-ART Practice and Collaboration, a research report commissioned by the Canadian Commission for UNESCO for Arts in Ecology – A Think-Tank on Arts and Sustainability. Published online by UNESCO. 2006. 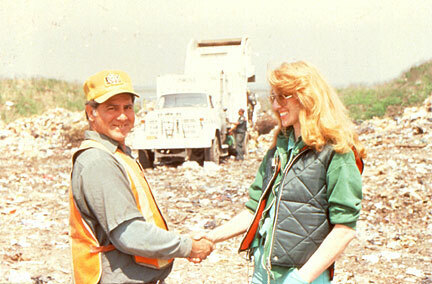 Also the website for Ann T Rosenthal’s course on environmental art provides a good introduction.